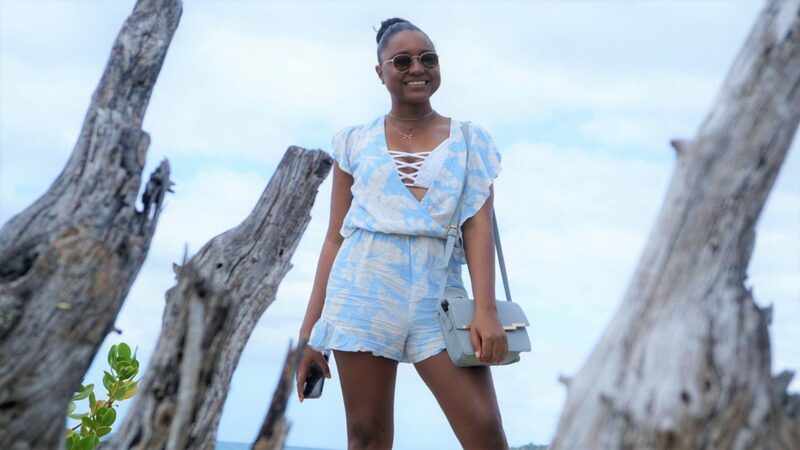 Sky Blue – From Beach Chic to Street Chic! You know it’s going to be a good day when you unintentionally match with the sky :). One of my favourite things (obviously) to do in Anguilla is go to the beach. The beach is awesome for a number of great reasons. Firstly, it’s fun! Regular beach days with friends and family, beachnics, watersports or beach parties are all guaranteed to be a good time. The beach is also great for relaxation. If I’m feeling stressed or looking for some inspiration for my blogs, I grab my tablet or my notebook, some wine and I head to the beach. With Valentines Day just around the corner, the beach is also great for dates. Take a relaxing walk along Shoal Bay Beach at sunset or have an intimate picnic on Rendezvous Bay. Super soft white sand, amazingly turquoise water and limited crowds, makes the beach the perfect setting for romance. On to the good stuff now. What to wear to the beach! Given the several different reasons I’ve mentioned for going to the beach, there’s no guarantee that I will actually go in the water. Especially during Caribbean ‘winter’ when the beach is still gorgeous but the water is just a bit too cold for my liking. Hence, I like to ensure that my outfit is transitional from the beach to other activities or vice versa. I have three key pieces I always reach for when heading to the beach (aside from my swimsuit). These pieces are light-weight, simple and fantastic transitional styles from beach chic to street chic! 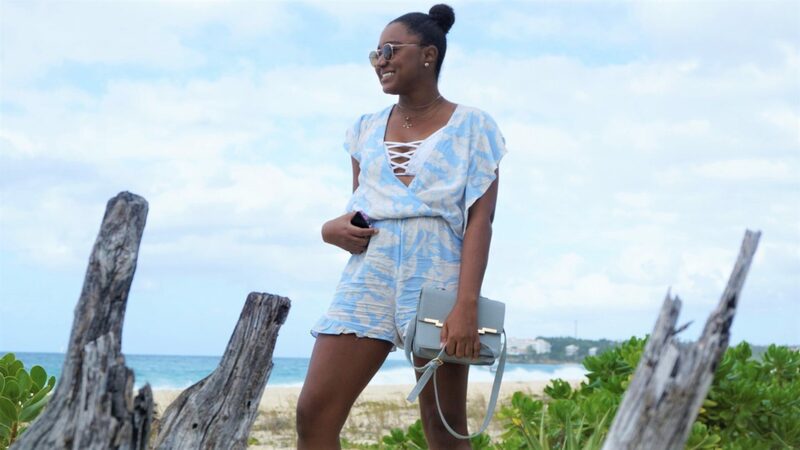 I recently wore this super girly, sky blue romper with a white lace criss-cross bikini underneath for a day date at the beach. The water was too cold for swimming so instead we bought some cocktails and relaxed on nearby beach chairs and enjoyed the sound of the waves and the sight of the surf crashing onto the shore. 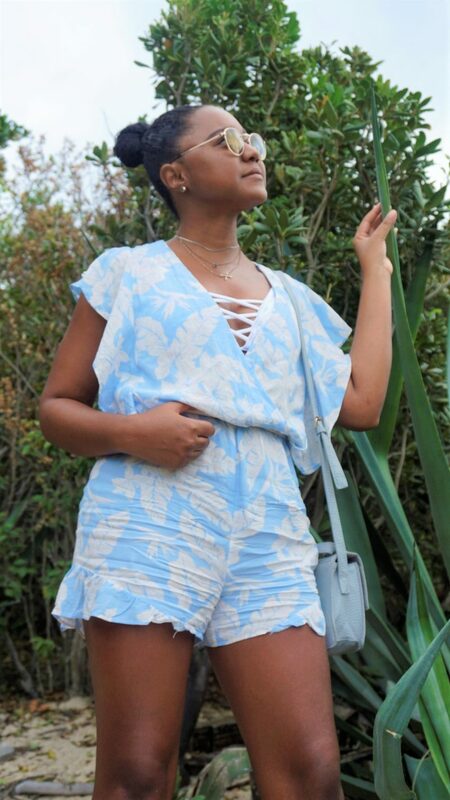 It was slightly chilly, so the romper was perfect for staying warm but still very practical and chic for the beach. We ended up heading to Sandy Ground afterwards for some more drinks so it was the perfect transitional piece from daytime beach date to a night out! My obsession with denim shorts is too real. I have easily 20-30 pairs in different colours, styles and lengths. Denim shorts are timeless pieces and they can be paired with anything. For beach days, I enjoy wearing my shorts with a one piece swimsuit. 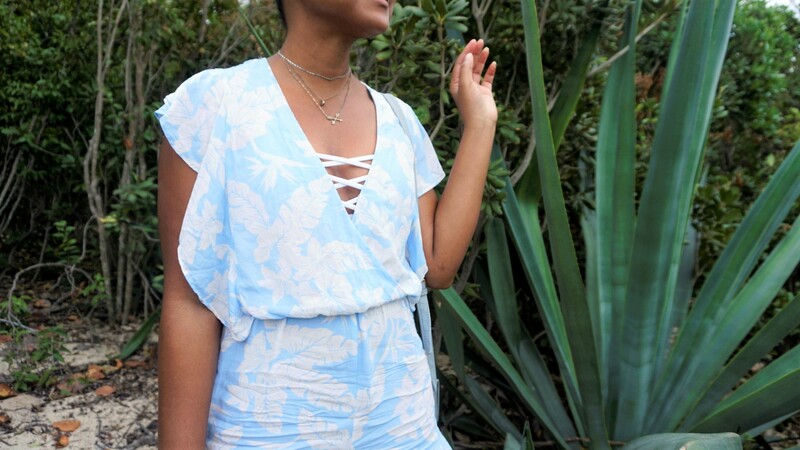 This is a great look as bathing suits and body suits are quite similar, so you can wear this outfit anywhere. I recently rocked this look at the Livin in the Sun Music Festival. 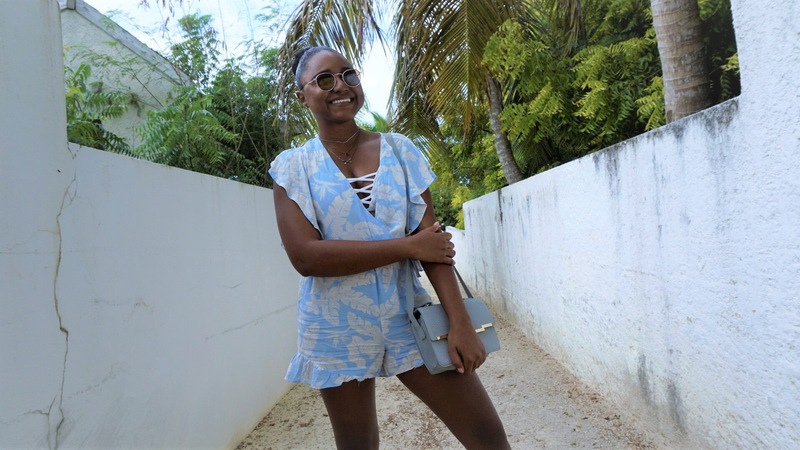 Style tip – Swimsuits are multi-functional! Wear your favourite one piece swimsuit as a body suit with some mom jeans/skinny jeans or a denim skirt for a super chic, semi casual look. For those days when you’re not feeling your most confident or you’ve just had a large meal or plan to have a large meal, flowy beach dresses are perfect for the occasion. Low maintenance, comfortable and stylish, dresses are often my ‘go to’ outfit for beach days. Shirt dresses are another great style that you can opt for as well. They are suitable for any body type and you are beach chic to street chic instantly! Check out my instagram for my favourite beach dress looks here and here. What is your ‘go to’ piece of clothing for beach days? Let me know in the comments below.